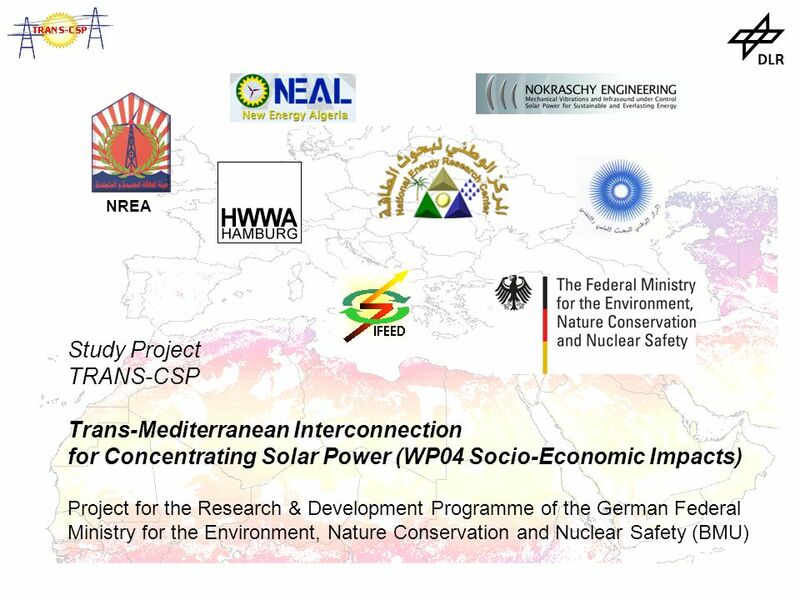 Study Project TRANS-CSP Trans-Mediterranean Interconnection for Concentrating Solar Power (WP04 Socio-Economic Impacts) Project for the Research & Development. 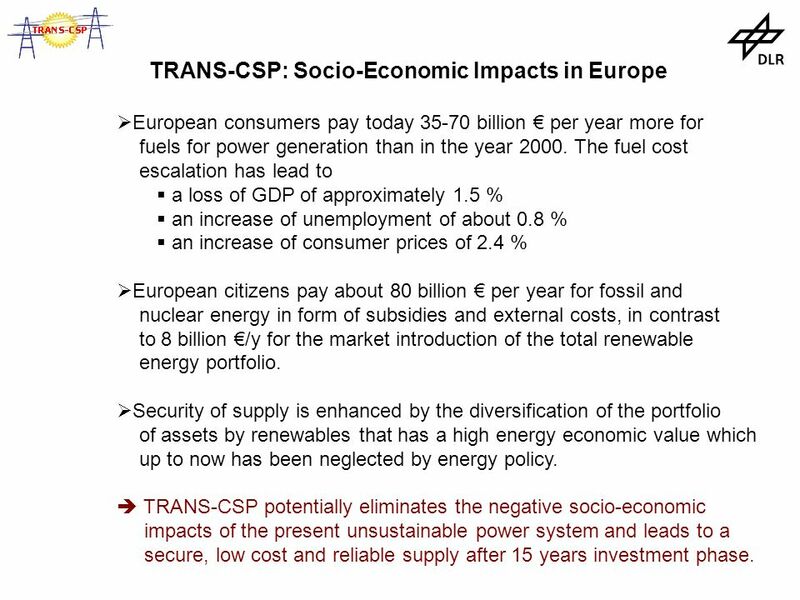 2 WP04 Socio-Economic Impacts Scope: Assess the impacts of the TRANS-CSP scenario with respect to wealth creation, compatibility, security of supply and cost of electricity. 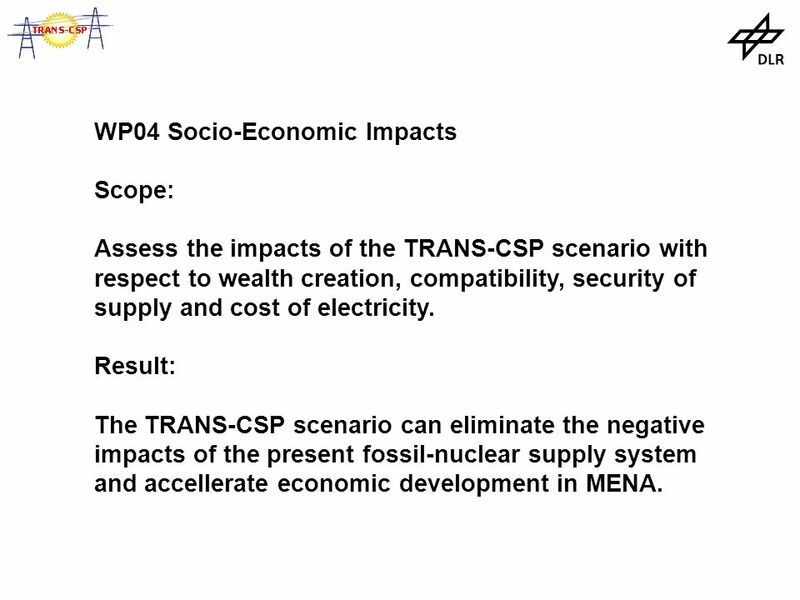 Result: The TRANS-CSP scenario can eliminate the negative impacts of the present fossil-nuclear supply system and accellerate economic development in MENA. 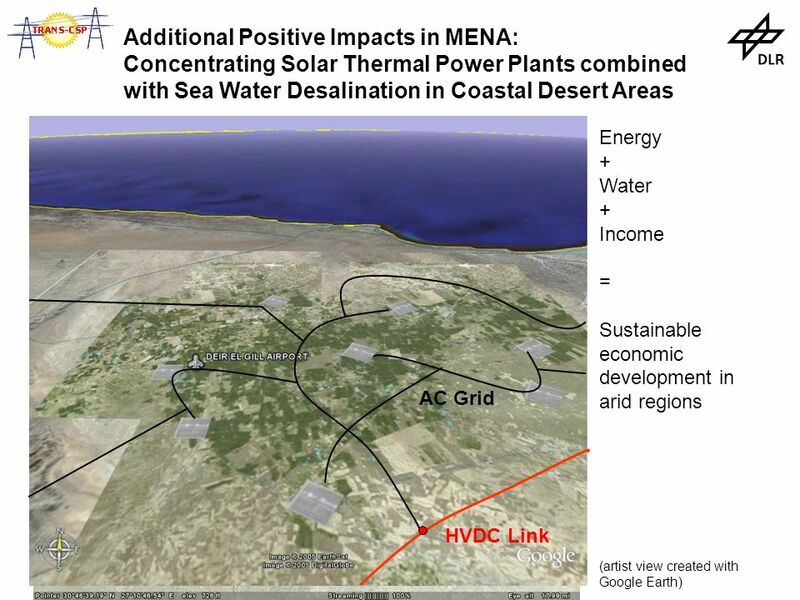 Download ppt "Study Project TRANS-CSP Trans-Mediterranean Interconnection for Concentrating Solar Power (WP04 Socio-Economic Impacts) Project for the Research & Development." 1 Providers Perspective on the Future Bill Levis President, PSEG Power Bill Levis President, PSEG Power. Energy National Policy Statements Anne Stuart DECC Energy Development Unit 22 October 2009. Energy. 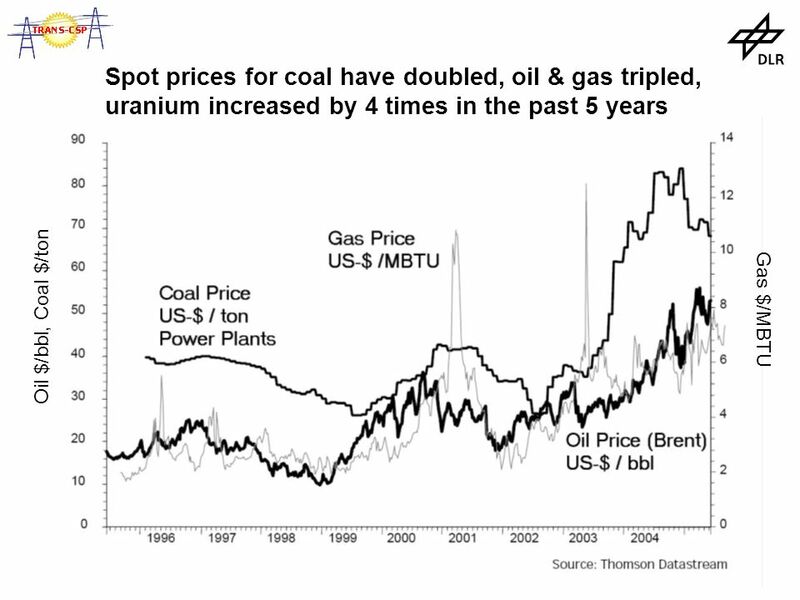 oil and natural gas  supply 62% all energy consumed worldwide  how to transition to new sources?  use until mc of further use exceeds mc of. 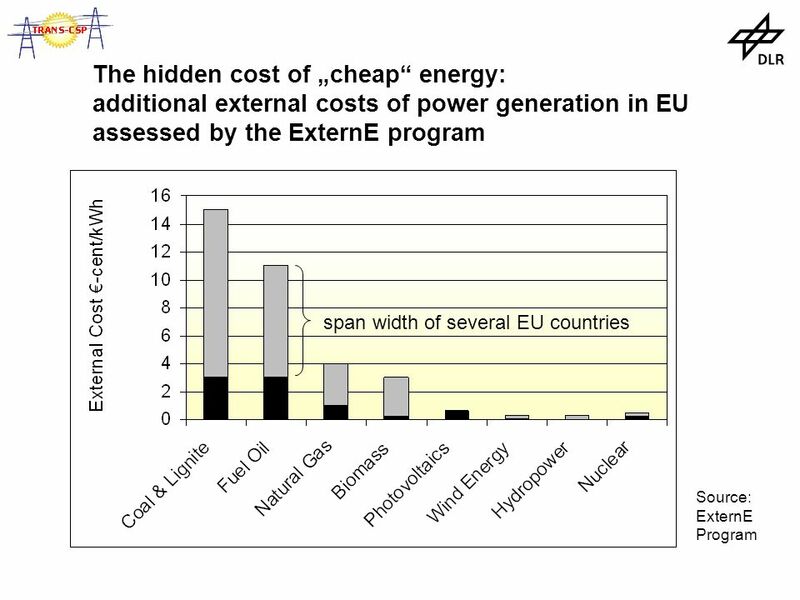 1 Antonio Soria Head of Unit Economics of Energy, Climate Change and Transport Institute for Prospective Technological Studies Joint Research Centre European. Strategies for power generation in Cyprus Dr. Andreas Poullikkas Electricity Authority of Cyprus 0 Workshop on Co-generation of Electricity and Desalinated. 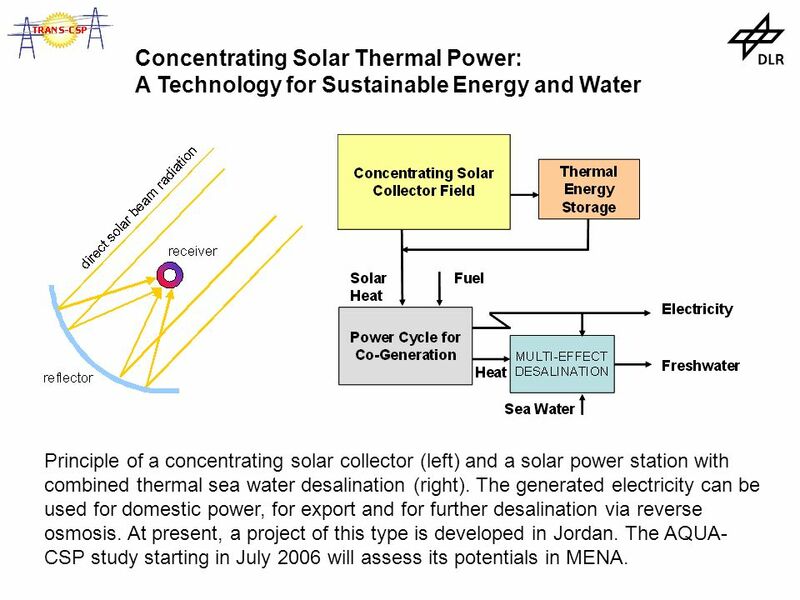 Study Project TRANS-CSP Trans-Mediterranean Interconnection for Concentrating Solar Power (WP01 Transmission Technologies) Project for the Research & Development. Work Packages: 1. 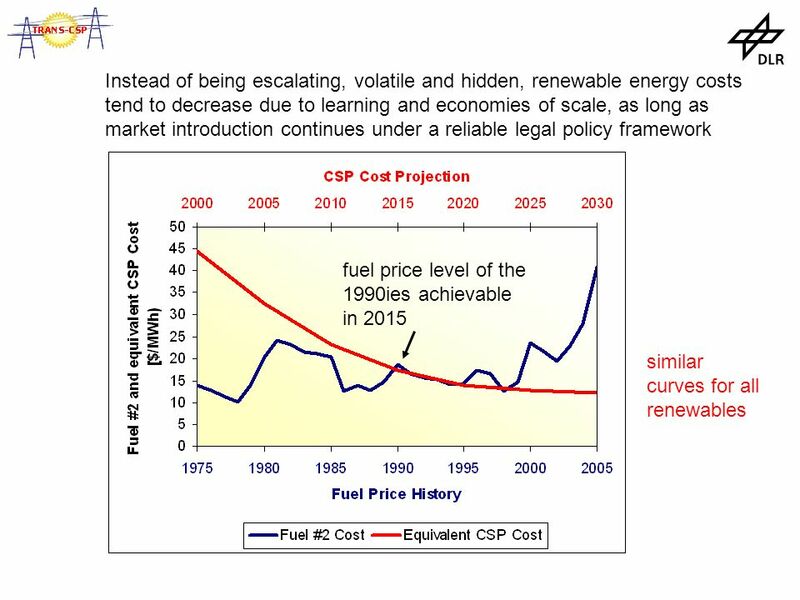 Technologies (combination of CSP and desalting technologies) 2. 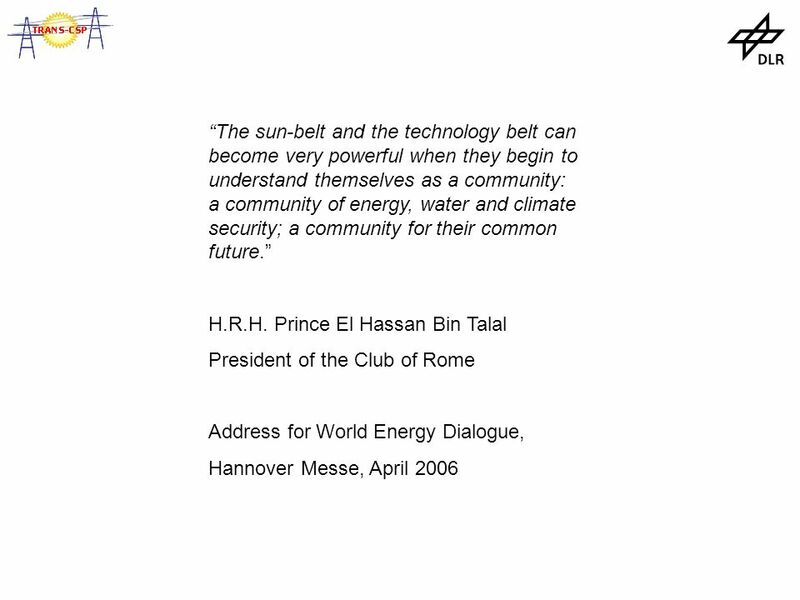 Water Resources and Solar Energy Resources 3. Demand Side Scenario 4. Russia in global energy context Remarks at the 11th Annual Global Energy Forum by Yevgeny Zvedre, Science & Technology Attaché Embassy of the Russian Federation. 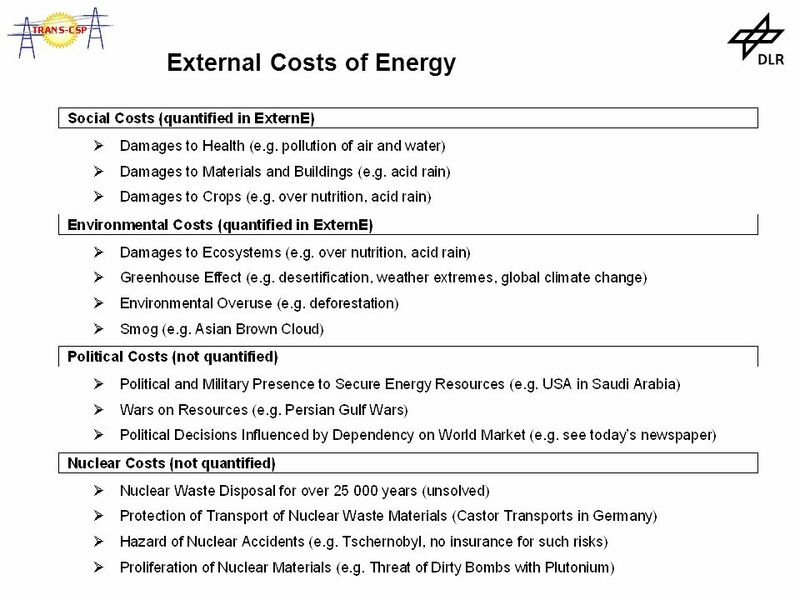 Methodologies for Quantifying Energy Security in the Power Sector William Blyth 24 th April 2005. 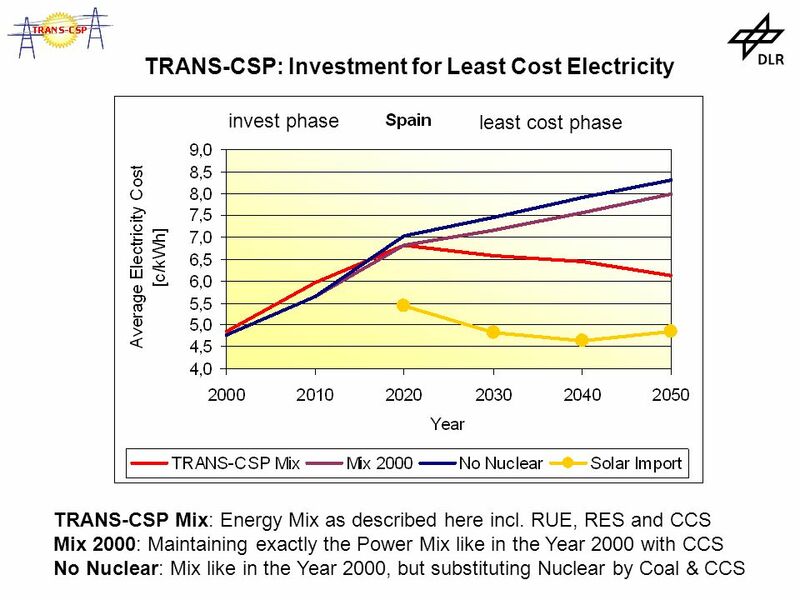 Study Project TRANS-CSP Trans-Mediterranean Interconnection for Concentrating Solar Power (WP03 Policies and Finance) Project for the Research & Development. 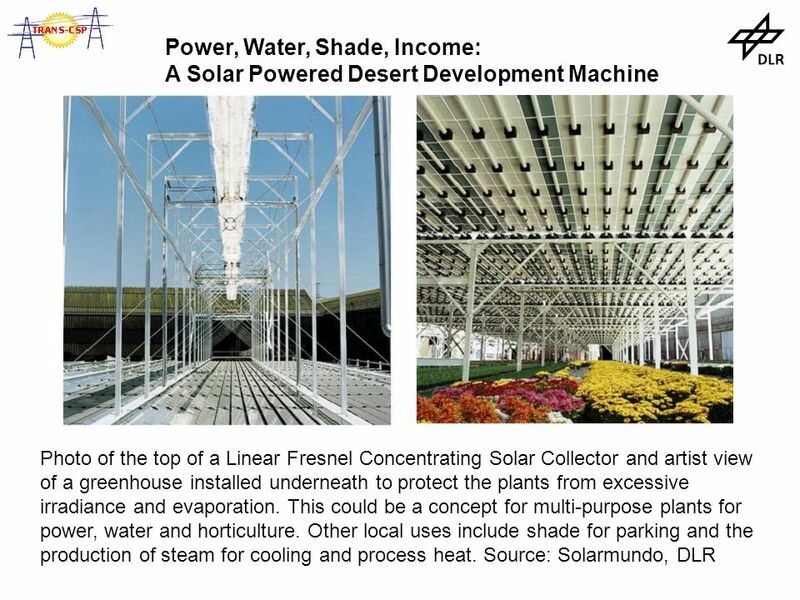 Solar Opportunities for Egypt El Nasr Pilot Steam Plant Amr A. Mohsen. 1 Brendan Devlin Adviser, Markets and Infrastructure Directorate B, DG ENER European Commission.